So far, we have seen how to write a simple app in Lua and get in running on your PC or Mac within the desktop player. The next step is to get the app running on a real mobile device. There are two ways to do this in Gideros. The first is to install a "Gideros Player" for the device (iPhone/iPad, Android device or Windows Phone). This is a special app which you side load onto the device. You can then control this app from Gideros Studio running on your PC or Mac (the device and your PC/Mac must be on the same LAN). 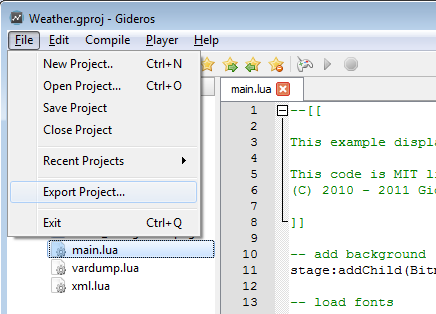 When you press "Start" in Gideros Studio, your Gideros project runs directly on the device. You can then make changes to your code and see them take effect instantly on a real device. This instant on-device testing over WiFi is unique to Gideros and allows rapid code development and testing. Generally installing the Gideros Player is easy as we provide you with the binary and you just "side load" onto your device, see Gideros Device Player. For IOS devices, you must be an approved Apple Developer for iOS and install the latest version of Xcode, currently Xcode 7. To run Xcode requires an Intel-based Mac running at least OS X 10.10 Yosemite. 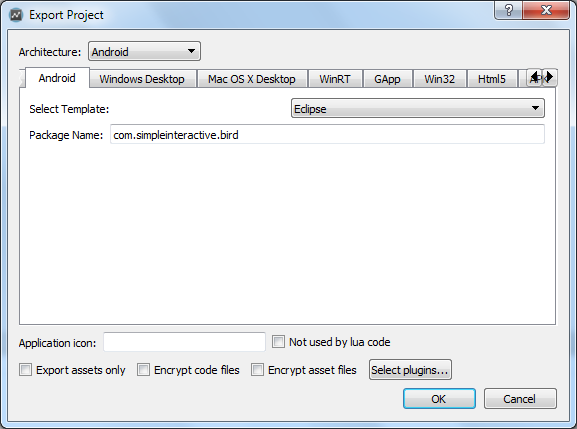 For Android devices you'll need Android SDK + Eclipse, or Android Studio. 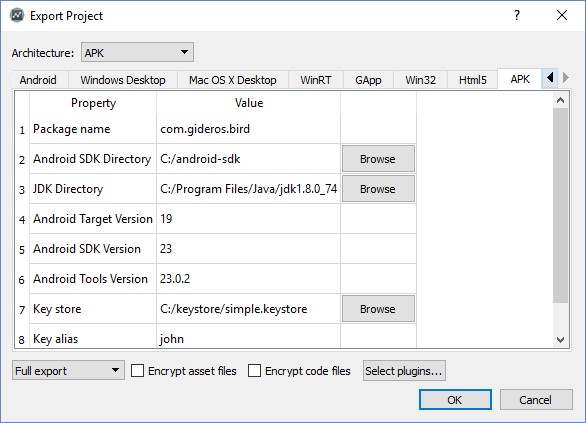 Gideros can also export Android packages directly though you will still need to install the Android SDK and related components (see Installing OS-specific SDKs). You can prepare Android apps using any PC or Mac. For UWP (including Windows Phone and Windows Store) devices you'll need at least Visual Studio 2013 for Windows (which includes the Windows/phone 8.1 SDK). We recommend you install the latest Visual Studio 2015. Gideros UWP export will also run correctly on Windows 10 and Windows Phone 10 devices.You will need a PC running Windows 8.1 or Windows 10 to compile UWP apps. There are no special requirements for exporting a desktop app (Windows Desktop or Mac OS X desktop). Gideros simply writes a directory containing the executable, libraries and your assets. You can simply double click on the executable to launch the app. To send it to others, it is sufficient to just zip this directory up and email it. You can also create a dedicated installer using programs like NSIS so that the app will automatically install on your end user's computer and be accessible from the Start Menu. When you press start button, your codes and asset files are transferred to your mobile device via WiFi and your application starts. There is a ready to use application for Android development GiderosAndroidPlayer.apk which comes with the installation. You can install it by hosting it on a website (eg dropbox) and navigating to the APK using the browser on your Android device. Alternatively connect the Android device to your computer using a USB cable and drag the APK onto the device. Now download "APK Installer" (free) from Google Play. Run this app and navigate to the Gideros Studio APK (wherever you copied it to) to install it. Note: you will need to set your Android device to "install apps from unknown sources" within the Android Settings menu. Connect your Windows Phone using a USB cable. After a moment the program should recognise the Windows Phone attached. Now click "Register" and it should announce your phone is unlocked. You will need to type in the username and password you provided when registering Visual Studio. Click "Deploy". 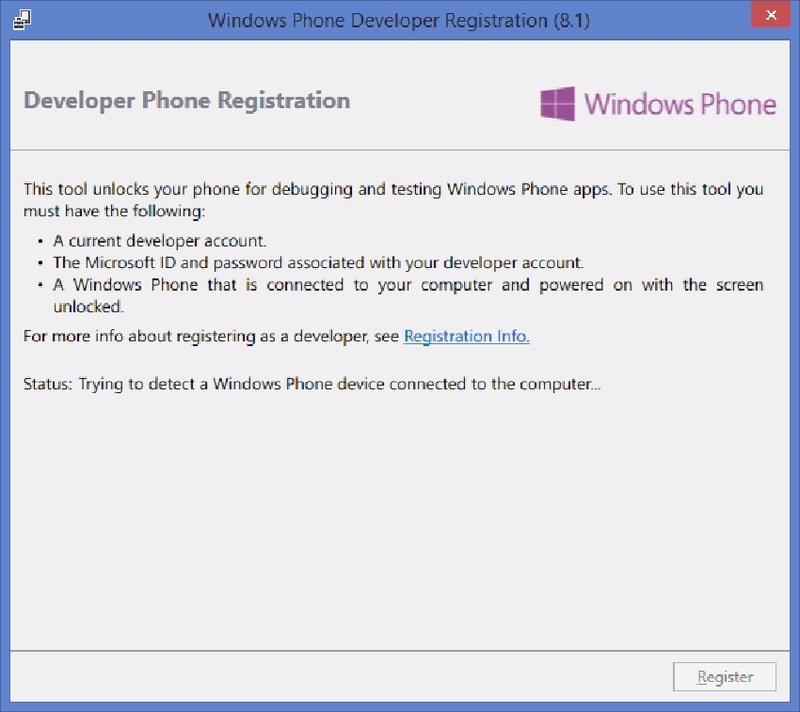 After a moment the program will indicate the Windows Phone player app was successfully deployed. Open it on your Windows Phone. 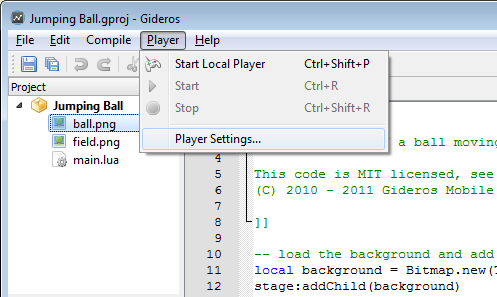 You can now run Gideros apps directly on this player from within Gideros Studio. Due to Microsoft limitations, you can't run Windows Store app player on the same device as your Gideros Studio are. Gideros Studio just won't connect, due to sandboxing nature of Windows Store apps. You need to run Windows app player on a Windows 8.1 or Windows 10 device and then control it using Gideros Studio running on another computer. The other computer can be any PC or Mac. Go to 'Settings', select 'Update & Security'. Click 'For Developers'. Select 'Developer Mode'. Navigate to this directory. Right click the 'AddDevPackage', select 'Run with PowerShell'. Follow the prompts. 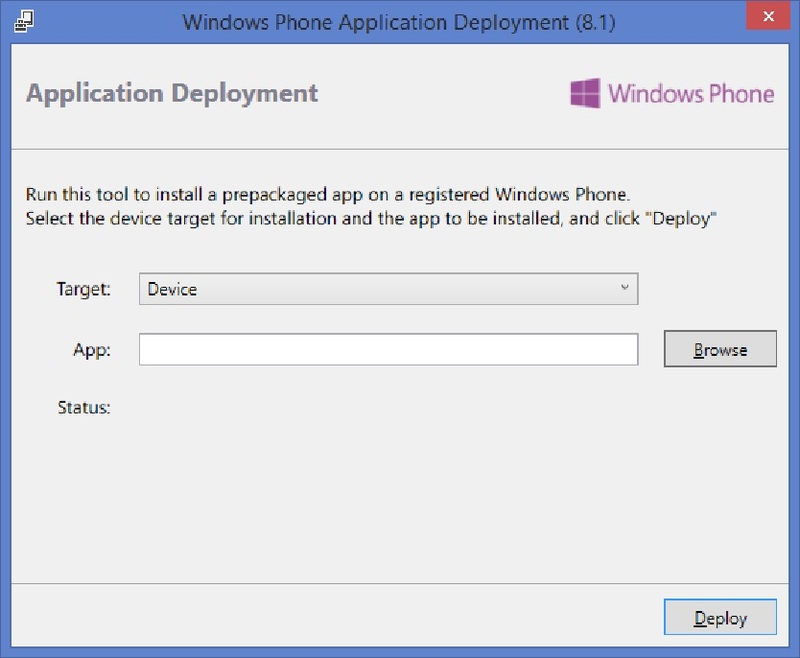 This section describes how to create a stand alone package, deploy and test it on a physical device, and upload to an appropriate app store such as Google Play, the iOS App Store or the Windows (Phone) Store. For desktop exports (Windows and Mac) Gideros does not prepare a package as such but rather a directory containing executables and resources. To distribute to another person you can simply zip the directory up and send to them. A more sophisticated approach is to prepare an installer which you can do using free, third party applications such as NSIS. For the mobile platforms, you will need to set up appropriate vendor-supplied SDKs to complete the compilation process and create a final signed package. For iOS and Windows UWP (for Windows Phone/Store apps) this essentially involves installing the latest Xcode and Visual Studio respectively. Setting up an Android environment is more complicated and consists of several stages (reflecting the open source nature of Android). The process of installing these OS-specific SDKs on your computer is described fully in Installing OS-specific SDKs. In this section we will assume these SDKs are set up already. For the second step, you need Intel-based Mac running at least OS X 10.10 Yosemite and an Apple Developer License. For each of these methods, you will need to install addition software as described in Installing OS-specific SDKs. We now describe each method in turn. You only need to choose one! 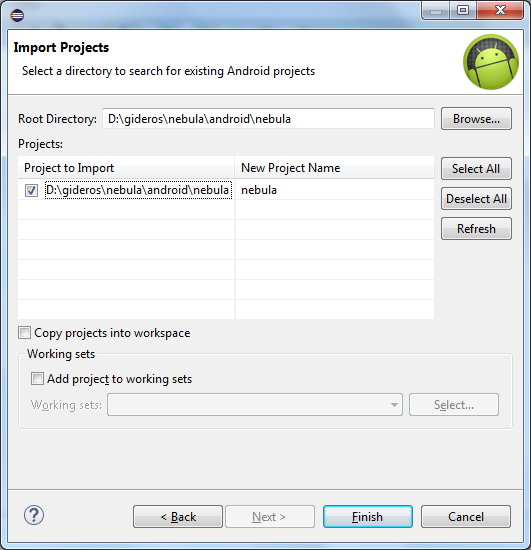 Select the Android project which was exported by Gideros as shown and click Finish (you should select the folder which contains ".project"
Right click on the project root in Eclipse. Choose "Android Tools" then "Export Signed Android Package..." In the next screen shown, select your keystore to sign the app. All apps submitted to Google Play must be signed in this way. If you have not created a keystore you can do so from this screen. Keep your keystore very safe and do not forget the passwords associated with it! Now enter the keystore password and click Next. In the next screen enter the alias and password of the key you want to use (for most cases it's simplest to maintain a single key). You can now create a signed APK at your chosen location. In Gideros Studio, select, File > Export and choose the Android tab as shown. From the pulldown menu, choose, "Android Studio". Enter your app ID in the form com.companyname.appname. You may need to alter the Android SDK version to correspond to the SDK installed on your computer. To do this, open the "app" folder in the project and double click the "build.gradle" file within this folder. Adjust the entries compileSdkVersion and buildToolsVersion to correspond to what is installed on your system. 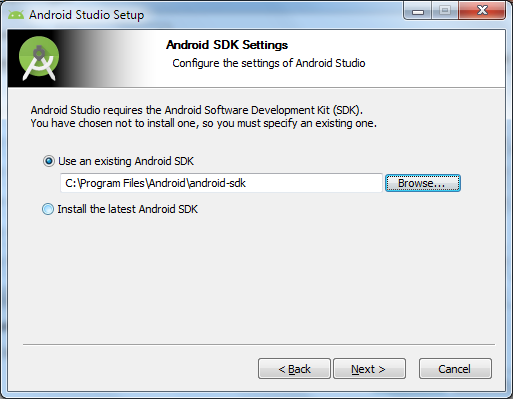 To see what you have installed, launch "Android SDK Manager" from the Start Menu. 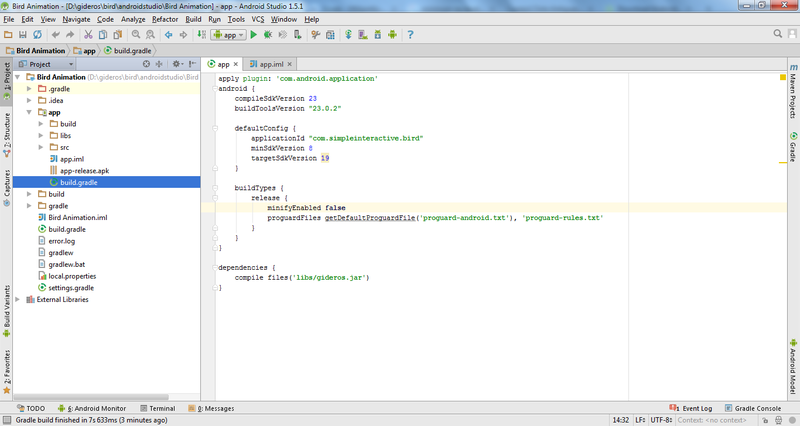 Having made the changes choose Tools > Android > Sync Project with Gradle Files. If you have a keystore already, click "Choose existing" and select your keystore and enter the password. Select the key you want to use and enter its alias and password. If you don't have a keystore click "Create new" and follow prompts to create a new keystore. Now click "Next" to export the APK to your chosen location. Enter the package name in the form com.companyname.appname. Enter the location of the Android SDK and Java JDK. You should have installed all these following the instructions in Installing OS-specific SDKs. 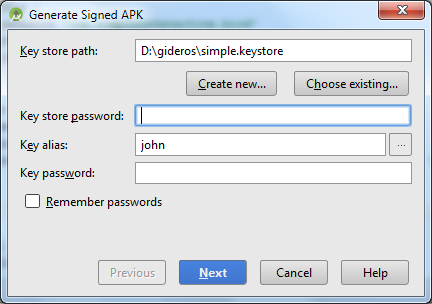 All apps uploaded to Google Play must be signed with a keystore. 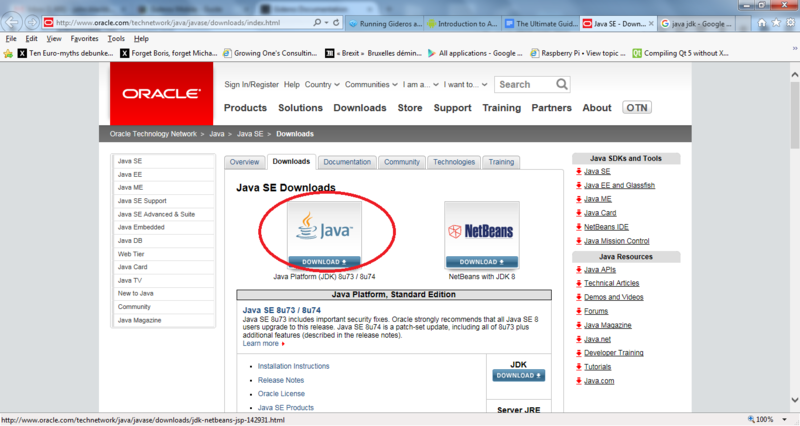 To prepare the keystore use keytool which comes with your Java Development Kit. (on my computer it is located at C:\Program Files\Java\jdk1.8.0_74\bin) Now enter the location of your keystore in the dialog box and select which alias you want to use. Enter the Android SDK version and Android Tools version you have installed on your computer. 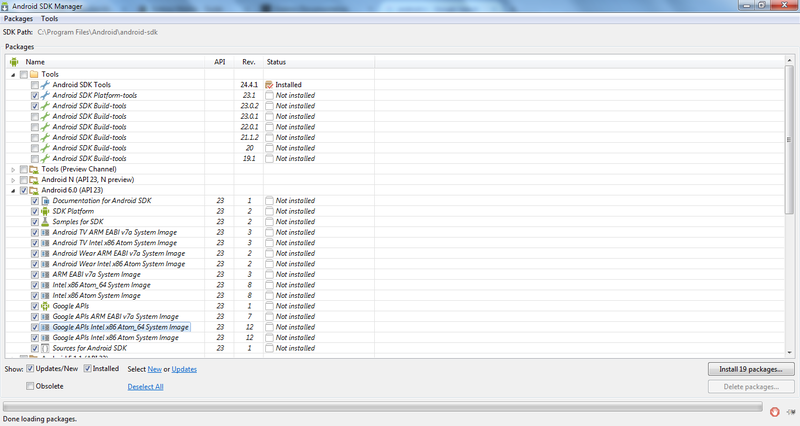 If you are not sure, run Android SDK Manager from the Start Menu. You can leave the Android Target SDK at 19, the default. Having entered all these details, click OK to create both a signed and unsigned APK at a selected location. You will be prompted to enter the password for the keystore and the keystore alias. Note, the first time you export in this way, Gideros will download and install Gradle which may take 5-10 minutes. Just be patient, subsequent exports will be much faster. The Start button should now say "Local Machine"
The Start button should now say "Device"
To submit your app to the Windows Store or Windows Phone Store, select one of the projects in the Solution explorer and select STORE > Create App Packages. You can either upload the app immediately to Microsoft or create a stand alone APPX file to distribute to colleagues. There is no need to enter an ID of your colleague's device: as long as his/her phone is unlocked s/he can install and test your APPX package immediately. Note that the process of submitting apps to the Windows or Windows Phone app store is the same, using the STORE menu in Visual Studio. Similar to how you can deploy players on devices, you can also build a custom player, with built in plugins for specific platforms. For example, if you have an Ad framework plugin for Android, you simply build Gideros Android player with this plugin and deploy it to device, to test it as you would with normal Android device player. Install the latest version of Xcode, currently Xcode 7. You will need a Mac running OSX 10.10 Yosemite or later. 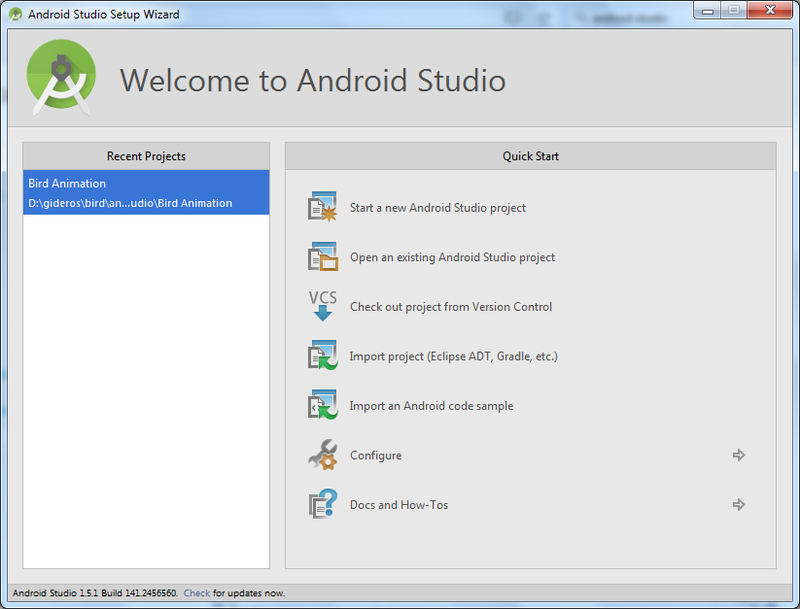 Export from Gideros Studio as an Android Studio project. 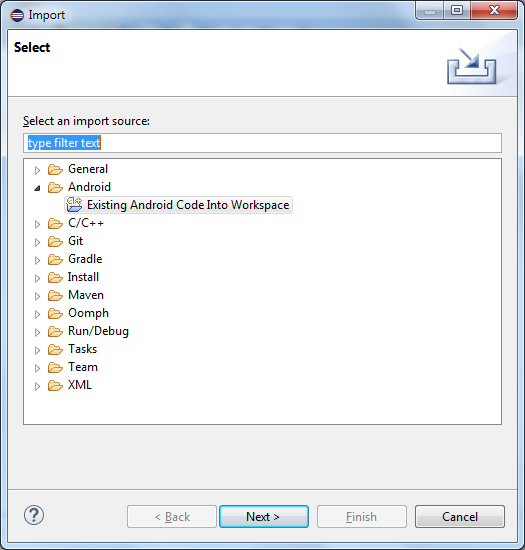 Import into Android Studio and export a signed APK. The direct APK method is quickest but currently does not support plugins. 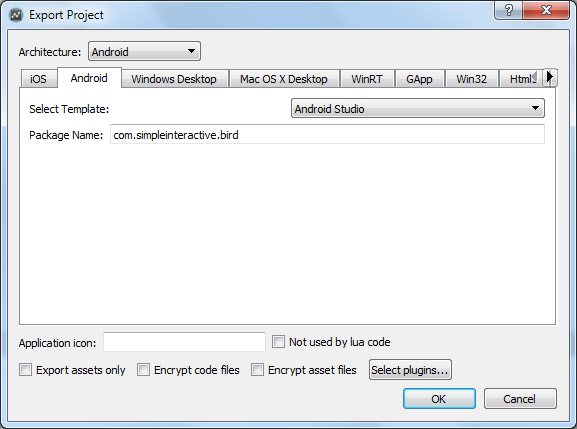 The other two methods allow more flexibility including the ability to add plugins and change the Android Manifest. 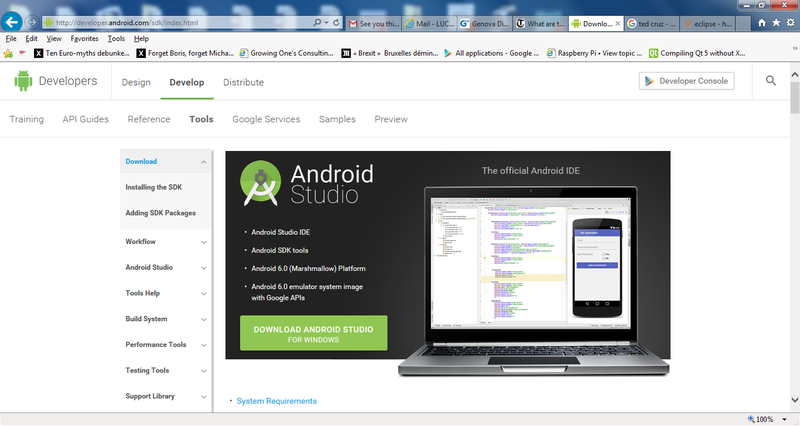 If you are new to Android we recommend the use of Android Studio as it is officially supported by Google. We now show how to install each of these environments in turn. 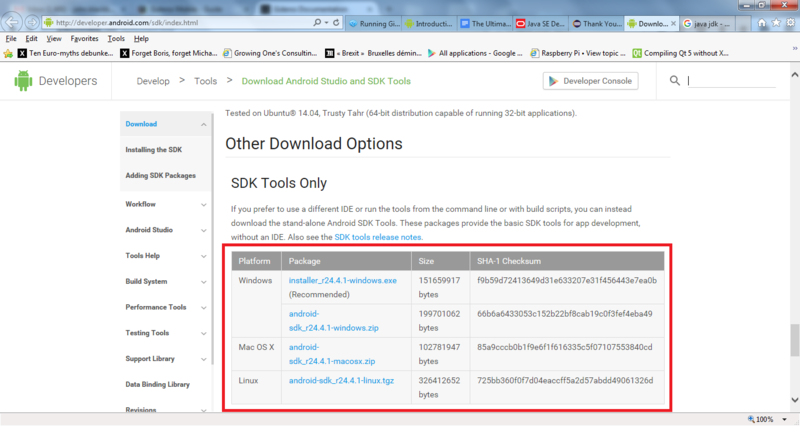 Download the latest Android SDK as shown. You will need the "SDK Tool Only" install within "Other Download Options". Chose the appropriate download for your operating system and double click on the install package to install the Android SDK. 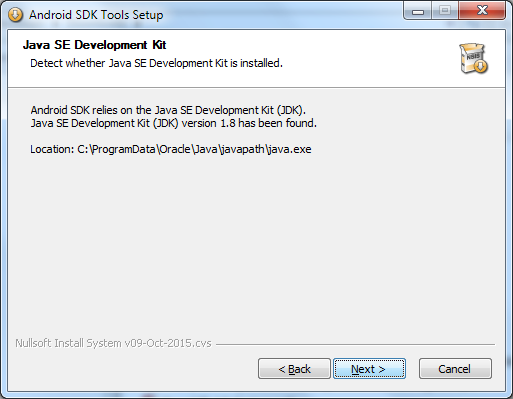 Note that when you install the SDK it will automatically detect the Java Development Kit as shown in the next image. 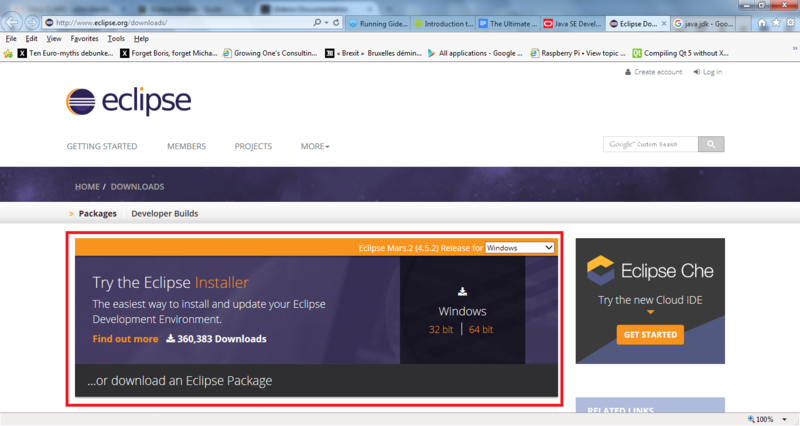 Start Eclipse, then select Help..Install New Software. 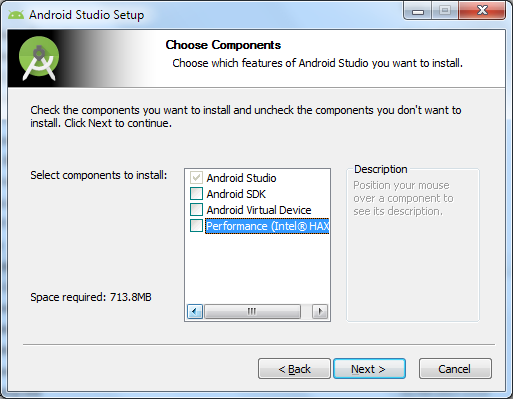 Download Android Studio as shown in the screenshot. Download the binary version of Apache Ant. Unzip the file to a suitable location. 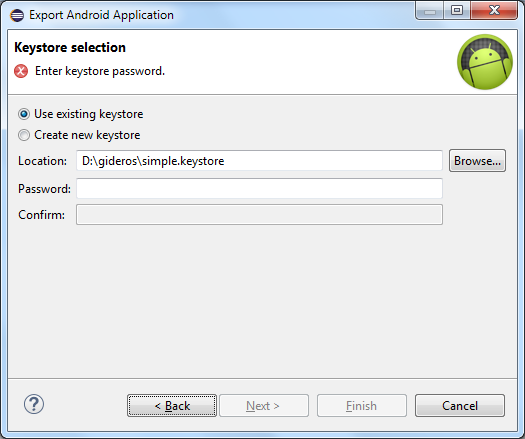 Remember this location as you will need it when exporting an Android app from Gideros. Install the latest version of Visual Studio (current VS 2015) and ensure you have added components for Windows Store/Phone development. 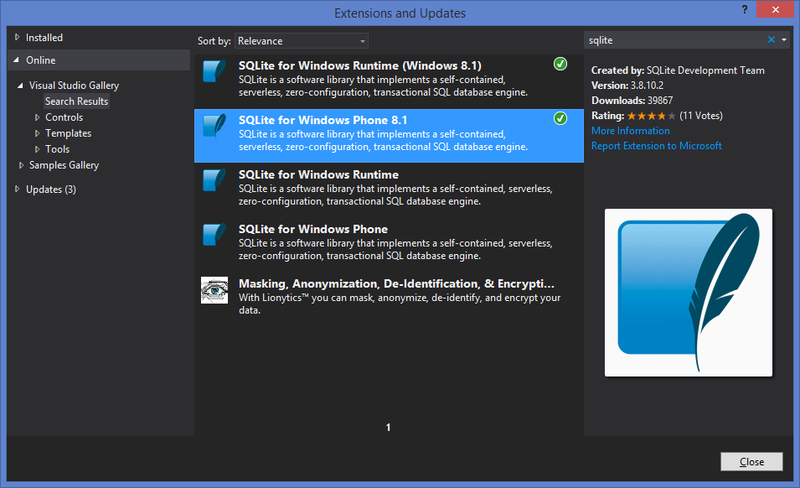 Gideros supports SQLite and to make this work on Windows Phone, it is necessary to add an extension to Visual Studio. 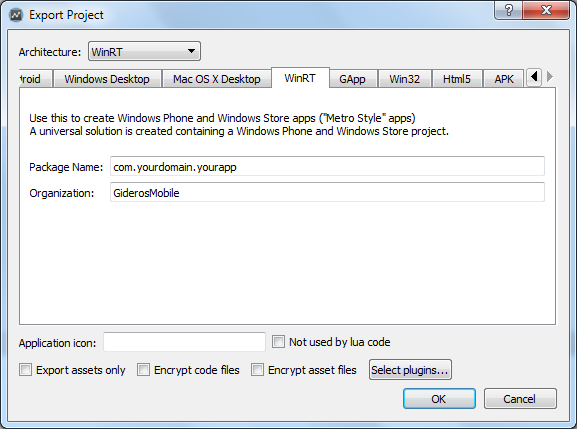 Even if you don't use SQLite, you will need to add this extension or Windows Phone projects exported by Gideros will not compile. It's easy to do as explained next. Of course, you only need to add this extension once. Open Visual Studio and go to TOOLS > Extensions and Updates. Select the "Online" tab on the left and type SQLite in the search bar at the top right. Select SQLite for Windows Phone 8.1/10 (as shown in the next screenshot) and select install. You will need to restart VS for the extension to take effect.